Crimestoppers to spread word, ISU Foundation accepts donations for reward. Indiana State University officials hope increased public awareness will lead them to missing student Gerald Smith of Avon. Wabash Valley Crimestoppers has agreed to use its resources to spread the word about Smith's disappearance via television public service announcements, billboards and a reward of up to $1,000. In addition, the Indiana State University Foundation is accepting contributions for an additional reward fund. Smith, a senior insurance and risk management major, was reported missing Friday evening, May 1. Since then, ISU Public Safety officers and other university staff have been joined by area law enforcement agencies and student and faculty volunteers in a series of extensive searches in and around the university's campus near downtown Terre Haute. "We are grateful for the support of Crimestoppers and the ISU Foundation. We have conducted four very thorough searches of all the likely areas where Gerald may have gone. We are now shifting our resources to concentrate on public awareness which we hope will lead to information about Gerald's whereabouts," said Bill Mercier, director of public safety. "We want to emphasize that we have no indication to believe a crime has occurred. Utilizing Crimestoppers resources will simply help us to keep Gerald's information before the public in hopes that someone will come forward with information," Mercier added. Smith, 22, was last seen at approximately 1 a.m. Friday near Ninth and Chestnut streets, at the east edge of the ISU campus. He is described as five-feet seven- inches tall, weighing 160 pounds with brown hair and brown eyes. He wears glasses and has a light beard. When last seen, he was wearing a red Hawaiian shirt. Anyone with information about Smith may continue to call ISU Public Safety at 812-237-5555. Calls may also be made to Crimestoppers at 812-238-STOP or online at www.wvcrimestoppers.org. In all cases, callers may remain anonymous. Individuals wishing to make a donation to the campus reward fund may call the ISU Foundation at 812-237-3732. 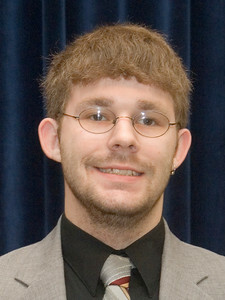 ISU officials hope increased public awareness will lead them to missing student Gerald Smith of Avon. Wabash Valley Crimestoppers has agreed to use its resources to spread the word about SmithÃ¢â‚¬â„¢s disappearance via television public service announcements, billboards and a reward of up to $1,000. In addition, the Indiana State University Foundation is accepting contributions for an additional reward fund.